Region: Carolina Mountains, near downtown Ashville. Colonial elegance with contemporary comfort in the Montford Historic District offering beautiful gardens, sitting porch, and inviting fireplaces. The home has four second-floor guestrooms and a fully equipped cottage, each with individual décor, queen or king beds, private baths and a whirlpool tub in the cottage. Amenities include a bountiful breakfast varied daily, an evening social hour and unlimited snacks and soft drinks. 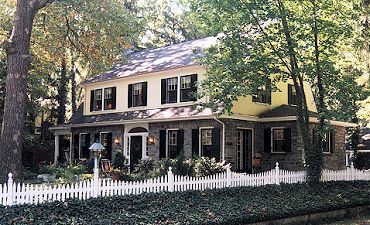 Close to the Biltmore Estate, shopping, antiqueing, sightseeing and dining.